The year is almost over. Soon, 2010 will be in the rearview mirror. Those of you who know me well know what a sad year this has been for us. It’s been a year of almost immeasurable loss. We are a family of two adults and our “kids” are (and always have been) of the four-footed variety. 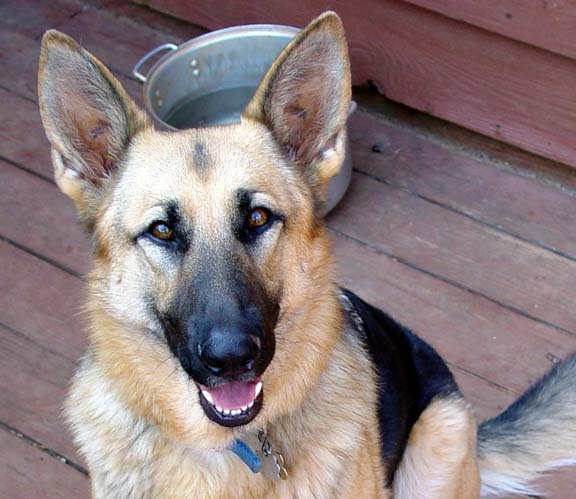 We have been greatly blessed over the years to have had in our family wonderful German Shepherd Dogs. All of our kids have come through one form of rescue or another. Five of six came via German Shepherd Rescue Resource of Atlanta (which, I understand is no longer in existence as this entity). Liesel came to us as a “foster.” We were already a home with three dogs and we really weren’t looking to increase our family. I met my friend after work to pick “Bella” up, I saw a gorgeous, very young, black & tan dog with an incredibly sweet face. I knew she would find a home very quickly. Little did I know HOW quickly. Our job was to bring her into our home to see how well/poorly she got along with our dogs and cat. We were going to keep her with us until her forever home was found. That must have been the second-shortest foster in the history of the organization. I brought this beautiful creature upstairs into our house where Jim was with the other dogs. She seemed to pay absolutely no attention whatsoever to our dogs, the cat, the rest of the universe…all she saw was Jim. All Jim saw was the new love in his life. There was instant chemistry, and I knew that my husband was smitten by a gorgeous blonde. I don’t exactly remember how long it took for her name to get changed from Bella (which would be wonderful for an Italian Greyhound, but not for her) to Liesel. Liesel and Jim – Jim and Liesel. If you saw one, you saw the other. They were inseparable. Yes, she was a good girl for me and she got along famously with our other dogs (and never chased poor Cooney the cat), but she was Daddy’s girl through-and-through. Sadly, our beautiful Liesel became quite sick – seemingly suddenly – in early August. She was lethargic, lost her appetite, and had some swelling. We took her to the vet to see what might be the problem. It only took a minute for the doc to come up with the diagnosis. He pulled some fluid from the swollen area – just to be sure. Lymphoma. He’d been certain right from the start, but had to be sure. We got a some prednisone and hope that she might be able to last up to six months. I don’t believe either Jim or I knew much of what we were doing for the ride home – other than going through the motions. The prednisone worked for a few days. Liesel was eating and acting more herself. All too short-lived. By Sunday, Aug. 15, Liesel was a very sick girl. She was vomiting blood and could barely move. We knew what had to be done. Monday morning, before any other patients arrived at the vets, we walked Jim’s girl into the room where we would say our farewell. The staff was as helpful as they could be considering none of this had been planned in advance. I won’t go into the particulars of the last minutes. All we can say is that Liesel was finally comfortable and we could hold her, talk with her and pet her through her last breath. How can you say good-bye to Jim’s beautiful girl, constant companion, and beloved friend of more than 10 years? Actually, we didn’t say good-bye, just farewell until we meet again. My heart was shattered for Jim. I knew it would be unbelievably hard for him – I was right. Little did I realize, I would be going through my own abyss of pain in only a couple of months.